Aquatic habi­tat refers to areas of the stream cor­ri­dor reg­u­larly cov­ered by flow­ing water. Aquatic habi­tats are where plants and ani­mals adapted to liv­ing in wet envi­ron­ments are com­monly found. Ripar­ian habi­tat is the tran­si­tional zone between the aquatic envi­ron­ment and upland areas only peri­od­i­cally cov­ered by water or adja­cent to wet­ted areas. The Ashokan Water­shed Stream Man­age­ment Pro­gram (AWSMP) seeks to enhance aquatic and ripar­ian habi­tat by encour­ag­ing stew­ard­ship and pro­tec­tion of exist­ing nat­ural areas and the restora­tion of degraded habitat. The AWSMP is fund­ing on-going study of the effects of flood­ing on trout pop­u­la­tions in the Eso­pus Creek. Some fish sam­pling indi­cates a reduc­tion in year classes for trout species due to flood­ing. Other stud­ies have focused on the spread of Didymo and effects on aquatic habi­tat in the Eso­pus Creek. Stream restora­tion and sta­bi­liza­tion projects under­taken by AWSMP are eval­u­ated for their impact on habi­tat before they begin. Over­all, stream projects are designed to mit­i­gate impacts and cre­ate improve­ments in habi­tat con­di­tion. This is typ­i­cally achieved by restor­ing the stream’s abil­ity to clear chan­nel bot­toms of fine sed­i­ments, recre­at­ing chan­nel fea­tures like pools and rif­fles, recon­nect­ing flood­plains, remov­ing inva­sive species, and reestab­lish­ing native ripar­ian and flood­plain vegetation. AWSMP par­tic­i­pates in the Catskill Regional Inva­sive Species Part­ner­ship (CRISP) and neigh­bor­ing water­shed pro­grams to offer pub­lic pro­grams on exist­ing and emerg­ing inva­sive species threats. We dis­trib­ute sev­eral pub­li­ca­tions on Japan­ese Knotweed, an inva­sive ripar­ian plant that can limit the growth of native veg­e­ta­tion nec­es­sary for opti­mal stream­bank sta­bil­ity. Other inva­sives of con­cern in the water­shed include Hem­lock Woolly Adel­gid, Emer­ald Ash Borer, and Didymo. 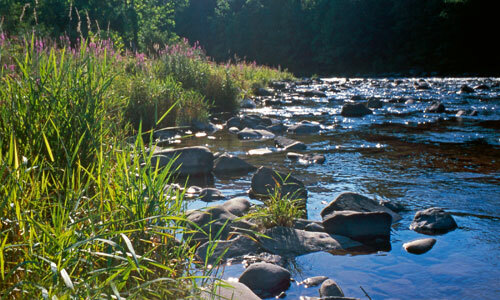 Check the News & Events page for vol­un­teer oppor­tu­ni­ties to restore native ripar­ian habi­tats or remove inva­sive plants from streambanks.